Apple Vs The FBI: What’s It All About? Apple and the FBI are locked in a battle over personal data - whose side are you taking? If you’ve been hiding under a rock you may have not heard that the FBI have handed Apple a court order to access the mobile phone of Syed Farook, the San Bernardino killer. Back in December 2015, Syed and his wife, Tashfeen Malik masterminded a deadly attack on a Christmas party in California, USA, killing 14 people and injuring many more. Before the attack, Syed had been in touch with Islamic extremists on social media, causing US intelligence officials to confirm that the incident was being treated as an act of terroism. Why won’t Apple just hand over the information? Back in 2014, Apple made the decision not to access encrypted devices to avoid ethical dilemmas such as this. While the FBI has stated that it doesn’t want Apple to break the encryption of the device, they do want Apple to alter SIF – the System Information File – which is the software that runs on the device. In relation to this case, the FBI wants Apple to create a new SIF software and to install this on Syed Farook’s iPhone. – Figure out Farook’s passcode. Yes, that four-digit passcode that you type into your iPhone several times a day (or hour, more like) has over 10,000 possible combinations and basically the FBI doesn’t want to have to give one poor soul the task of manually guessing them all, so it wants Apple to allow the passcode to be tried electronically or, as Tim Cook’s letter states, by ‘brute force’. A process that could take minutes, if not seconds to do! – Prevent the phone from erasing information. If Farook had enabled some of the phone’s security settings, after 10 failed guesses at the passcode, the iPhone could erase all personal data stored on the device which could mean that the FBI lose evidence for their investigation. – Last but not least, the FBI wants to control several aspects of the SIF, but have stated that they don’t necessarily need to know how it was done, allowing Apple to work on the phone in their own headquarters and in a way that doesn’t risk the new SIF software being released into the world for possible abuse. The FBI have stated that the SIF will only be used on Farook’s phone and will only be known by Apple, who can then destroy the software once it has been used. So why are Apple not playing ball? In a letter to its customers that was released on the 16th of February, Tim Cook – Apple’s CEO – has laid out why Apple won’t be complying with the FBI’s court order. In the message to its customers, Tim states that he does not want to introduce a ‘backdoor’ to the iPhone systems where third parties can enter the phone of an individual by bypassing the usual passcode system. While this may seem like a simple request, Apple worries that by creating a backdoor, they’ll not only be making Farook’s iPhone insecure and his personal data accessible, it’ll in turn make every iPhone’s security weaker. Why so? Backdoor systems are highly lucrative – hackers can sell backdoor access to software, as well as devices to criminals and even to governments looking to obtain data or even spy on individuals and larger groups of people. So who is backing who? Software security is a contentious issue anyway, but even more so in the case of an act of terroism. While it’s difficult to support Apple’s decision to not override their encryption policy for this specific case, it’s the wider implications of the case that could affect the security of almost every iPhone user’s personal data that is the main concern. While the White House has come out to fully support the FBI’s plight in gaining access to Farook’s phone, so has the controversial Presidential candidate, Donald Trump. 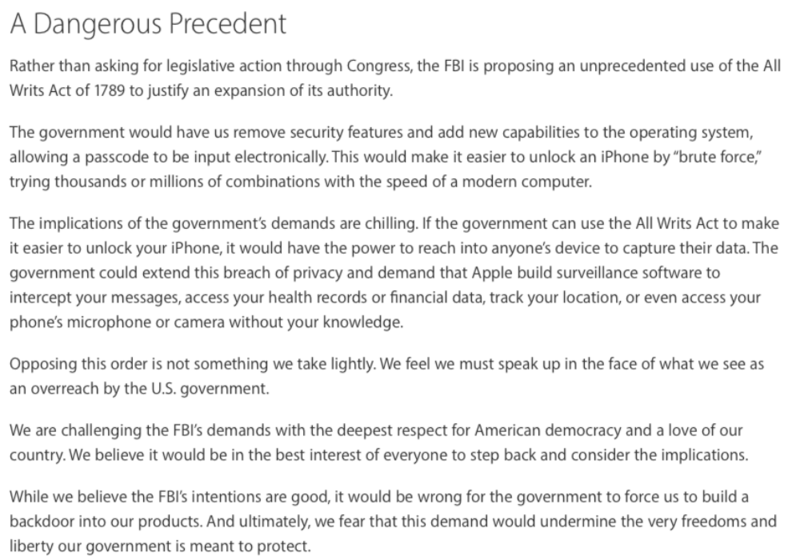 Others have argued that Apple are effectively preventing law enforcement from carrying out a warrant.